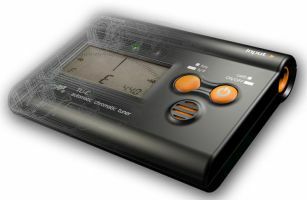 chromatic, automatic tuner for instruments - compact design: lightweight and pocket format - manually selectable tuning range - automatic tone selection - adjustable tuning calibration in a: from 435 hz to 445 hz - tuning mode: flat or normal - signal input via input jack or integrated microphone - signal output via output jack - automatic shut-off after 5 minutes of no signal input - foldable support stand - colour: black. Auto-Chromatisches Stimmgerät für alle Instrumente. Stimmbereich: E1 (41.2 Hz) bis D6 (1174.7 Hz) A4 Calibrierung: 435 Hz ~ 445 Hz (1 Hz step) Tonarten: C oder F/ Bb / Eb (Blasinstrumente) Maße: 96 x 68 x 20 mm (LxBxH) Gewicht: < 75 g Farbe: schwarz Stromversorgung: 2x1,5 Volt DC, AAA Batterien incl.